The Sons of Jacob Synagogue located at the corner of McIntyre Street and Cassells Street was originally constructed in 1906 or 1907. Sons of Jacob History: Before becoming a place of worship for the local Jewish community in 1925, it operated as different retail businesses, including a furniture store, grocery store, wallpaper store, and a second-hand store. The synagogue was created through a retrofit circa 1950s, considering the style and palette used. The main entrance features double wooden doors, with a paneled style and a stained glass transom within the arched opening above. The main floor windows facing the street fronts are a series of Romanesque arched openings that feature stained glass windows. 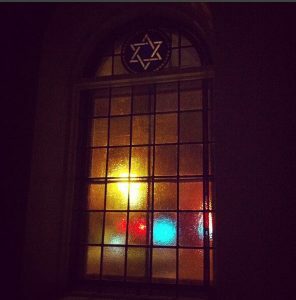 The interior features stained glass window patterns featuring a Star of David motif. Architectural interest in this property lies with its conversion to a synagogue from a neighbourhood commercial enterprise. The Sons of Jacob Synagogue is the oldest synagogue north of Toronto still in use.